Kshama Sawant on how the fight against race- and gender-based oppression fits into the fight for socialism. Three years before Bernie Sanders entered the national stage with his 2016 bid for the Democratic primary, Kshama Sawant brought socialism back to the American vocabulary by becoming the first open socialist in nearly a century to win a citywide election in Seattle, Washington. 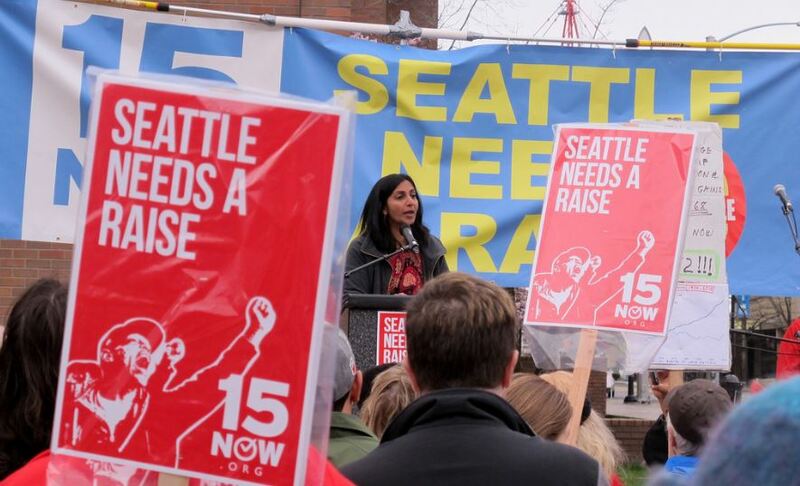 The issues Sawant championed in Seattle have become central demands of the now-resurgent left: a fifteen-dollar-an-hour minimum wage, raising taxes on the wealthy, and rent control in quickly gentrifying cities. Despite charges that she was “too ideological,” voters returned her to the city council in 2015, showing not only that the Left could win office, but keep it. Crucially, Sawant has also been outspoken on racial and gender oppression, imperialism, and US support for Israel. This has served to undermine one of the Democrats’ central rationalizations for refusing to take on Sanders’s social-democratic policies: that you can’t talk about social and economic justice at the same time. Sawant’s tenure has shown that not only can the Left take on both economic and racial and gender justice, but that it should. Here, Daniel Moattar talks to Sawant about social movements, the Fight for 15, and how race and gender fit into the fight for socialism. How do considerations of race, of gender, of immigration status — of marginalization more broadly — inflect your socialism? The society we are fighting for has to be free from all oppression. From an economic standpoint, you cannot have democratic economies unless the society at that time also works towards eliminating all forms of oppression: misogyny, racism, discrimination against native people, sexual violence. All of this has to be part and parcel of the agenda, as far as the vision that I am fighting for. We don’t believe that we will be able to build a revolutionary movement without engaging with mass numbers of people on the ground on the issues that they are organizing around. We took up fifteen dollars an hour — Socialist Alternative didn’t invent that demand. It was a political and economic demand that was being raised by low-wage workers themselves. We took it up not because we believe that fifteen dollars an hour will cure all ills, but because that’s a demand that a mass number of workers are willing to come together, get organized, and fight for. But I don’t think you can achieve any of this without bringing together people of different races, different genders, and in reality, it’s a two-way thing. You cannot fight for economic justice without also being a fighter against black oppression or against racism, against misogyny, against sexual inequality. On the other hand, if your goal is to end racism, we’re not going to be able to do that on the basis of capitalism. The logic of the capitalist system is such that if you’re fighting racism, it forces you to reach anticapitalist conclusions. You cannot reject anybody’s starting point to radicalization. The Black Lives Matter movement is an incredible indicator of the times we live in: that after almost fifty years, we have the beginnings of a black freedom movement. In Seattle or in general, where do you see the vital intersections of economic justice and marginalization based on race and gender — or, conversely, places where they should be understood to intersect but aren’t? I think fifteen dollars an hour is a starting point, and I can mention other things also from the Seattle context. If you look at the statistics, which are the communities that are most impacted by the entrenchment of low wages with the destruction of unionism and the taking back of reforms that were won in the past? It’s black people, brown people. It’s women. Which are the most struggling households? It’s single moms of color who are the most impacted, by example, for homelessness — as a proportion, I mean. A larger proportion of LGBTQ communities, a larger proportion of trans people, are affected by homelessness, low wages, discrimination in the workplace. When we were fighting for fifteen dollars an hour, there were some bourgeois commentators and local political figures who would try to hoodwink black and brown workers into not joining the Fight for 15 by saying to them, “This is not for us, what do we get out of fighting for fifteen? What does that do about, say, police brutality?” and so on. The only reason it became such a historic victory in Seattle was because black, brown, white workers all rejected that false divisiveness. Workers of color and white workers recognized — and we wouldn’t have won if they hadn’t — that we have to fight for this together, because our fates are interlinked. As a Marxist, I don’t see racism as something that exists just coincidentally alongside economic injustice under capitalism. Any exploitative and deeply unjust society under capitalism will need to create divisions among the large ocean of the oppressed. Without that, it will not be able to keep that system sustainable. Racism is not incidental. The fact that women, still, in no country under capitalism, even today, do they get paid the same as men for the same kind and quality of work — that is not incidental to capitalism. This is part and parcel of the logic of capitalism. It is part and parcel of keeping people divided. There are small but really brilliant victories we’ve been able to achieve in Seattle where it wasn’t just black and brown people working alongside white people, but where people of color, women of color, led the struggle. Last year, we passed the Carl Haglund law. Carl Haglund is an infamous slumlord who owns a number of properties in Seattle. His attitude towards his tenants has been almost legendary. The Haglund law, when it passed, said that no landlord can raise the rents of his or her tenants as long as there outstanding housing court violations. That seems like a straightforward thing. It seems like a landlord should not be able to raise rents if there are rats running around and the landlord hasn’t fixed that. The reason we have that law is that Somali immigrants, led by a Somali working-class woman, fought to bring this to our attention. It took them to be willing to fight for it boldly every step of the way, and withstand intimidation. They were not white tenants supported by people of color. These were tenants of color who led the struggle and were determined to win. It’s not just a one-off. In my office, we just launched an affordable housing alliance, which we hope will be a long-lasting, sustained coalition of individuals who will continue fighting for not just small, piecemeal reform for renters, but making the movement toward overthrowing the state ban on rent control. We’re going to face the wrath of the real estate and landlord lobby. Not to mention, in the background, there will be Amazon fighting against us. This will need to be a powerful movement. Sahro Farah, the Somali woman I mentioned, was there saying she wants to be a prominent fighter in the affordable housing alliance. You can see that for working-class people of color, if you’re not a bourgeois politician who has to do all kinds of mental gymnastics to justify capitalism, it’s straightforward. You don’t need to explain this to people. People are smart, and they get how the system is stacked against them. People understand that the racial discrimination against you is somehow linked with the economic discrimination against you, and that we’re not only going to have to fight explicitly on both fronts, but to recognize that this problem is not going to be solved on the basis of an economically exploitative system. There’s a powerful idea of a resurgent left right now. But there’s also a pervasive media narrative that leftism, and especially socialism, are by and for white men — at least in the United States. Where do you think that perception comes from? Does your experience bear it out? I think there is no doubt that the perception socialism is a white idea — it’s not a consequence of actual observations of people of color. In my view, to a large degree, it’s a manufactured concept. It suits the ruling class to find different ways of discrediting the ideas of socialism precisely because those ideas are extremely attractive to a large mass of people, many of whom are young workers of color. The recent Harvard-Harris survey shows that Bernie Sanders is the most popular politician in America. This is not among highly educated middle-class voters. This is among all demographics. His popularity is in the stratosphere. 80 percent of Democrats. 73 percent of registered black voters. 68 percent of registered Hispanic voters. Is he popular because he’s white? Is he popular despite being white? I don’t think race, in any essential way, enters the equation. What people like about Bernie Sanders is that he is fighting against the establishment. His campaign last year was a real program, a serious program, of social-democratic demands. Single-payer, fifteen dollars an hour, education for all, fighting against the corporate establishment: this is what people are looking for. It’s a complete myth that socialism is only for white people, but it’s not surprising in any way that the ruling class in America is trying hard to discredit this idea, because, as I said, it’s extremely popular. It’s one of the signs we have to point to as evidence that we are in a fundamentally new period. This is not the same as even five or seven years ago. Socialism is no longer a dirty word. But this is not the Cold War era. New generations, entire swathes of young people, have no connection whatever to that vilification of socialism. They are angry about the status quo. They are angry because they know no matter how hard they work, how much education they get, they will never be able to replicate the middle-class living standards of the previous generation. It’s not because white socialists came and told young people of color, “You should subscribe to the ideas of socialism.” People are drawing their own conclusions. Look at the crushing burden of student debt. You saw the young person who questioned Nancy Pelosi at a town hall. Her response was completely tone deaf. It shows why the Democratic Party is having such a hard time keeping the faith with young people. The reason they’re in crisis is that they’re out of touch with the reality that the tide is shifting now. People are looking for a political alternative that will actually fight for them. They’re not looking for some mild rhetoric and some even milder reforms. Socialist Alternative and I, on the left, we were very clear about this last year: of course there’s a difference between Trump and Clinton. That’s not in debate. What is in debate is, what does the Democratic Party establishment offer as an alternative? And how do we fight the right-wing agenda? How do we take advantage of the fact that the Trump administration is now absolutely beset with scandal and crisis? How do we take advantage of the hunger among large numbers of people to build big movements and win big victories? Can we do that by tying ourselves to the Democratic Party? That is in question. There’s a perception that the Democratic Party is entrenched in marginalized communities, whether or not it gives anything back for those votes. For Socialist Alternative and other socialist organizers, do you think there’s a road to high and sustained recruitment among immigrant communities and communities of color — one that could make it competitive for local office in cities beyond Seattle? What does that path look like? I don’t have a crystal ball on what that path would look like, though that question is extremely important. I don’t think we can minimize that the challenge that the Left faces of really building a strong base among the most oppressed communities — the communities that have only had the Democratic Party as something of a political alternative to the right-wing agenda. It’s no surprise, as far as electoral politics, that many voters of color feel that it [the Democratic Party] is their only option. As a Marxist and a brown-skinned person, I would never fault anyone for making that choice. The fault does not lie with working-class people who face a seemingly timeless paucity of political choices. The fault is with the Left itself. The challenge is now upon us to build real fighting movements and political organizations that will bring forward many of these demands that can be brought forward only in an organized manner. Building viable political parties is going to have to be a component of building strong social movements. It doesn’t matter what the starting point is. There is a mass of people willing to fight for, for example, single-payer health care, and there is a duty on the Left to put whatever firepower we can to build those movements. One important lesson from history is that — and it doesn’t happen every day, but when it does happen — there is a certain crescendo of social movements in society. Movements feed off each other. If you look at the presidential history of the United States on paper, Richard Nixon appears as perhaps the most progressive president in recent decades, not because he was in any way progressive — he was a rabid, racist, misogynist warmonger — but at that time, social movements were both powerful and empowered, and movements sort of coalesced into one another and really fed off one another. So you have a whole range of victories, like the formation of the Environmental Protection Agency, the legalization of abortion — which didn’t start in the Supreme Court but in movements working on the ground — and the end of the Vietnam War. Movements for women’s rights, black freedom, antiwar, economic justice, various movements, various aspects of this broken society under capitalism, fueled the ambitions of young people. There hasn’t been a real left alternative to engage people of color and activists of color, and the onus lies on the Left as a whole, which people of color like myself are a part of. If you look at the support that the establishment claims, because you have to make a distinction between the Democratic establishment as its base, that is not in any way as entrenched as they would like to believe. If you look at the voter turnout in some of the states where Trump won, they were at historic lows. A lot of the people that didn’t turn out to vote for Clinton were people of color. Part of rejecting racism and oppression is recognizing that people of color are, like any other people, observing things from various angles. Who do you think lost out in the wave of industrialization of the post-NAFTA era? It was not just white workers. It disproportionately was workers of color from disadvantaged households. Deindustrialization impacted a host of black communities, and once a family goes into poverty, it becomes intergenerational, so families now are paying the price of what happened then. Who was most affected by the gutting of welfare under Bill Clinton? Black women who were raising children. For us on the Left, part of the responsibility is recognizing the weight that rests on our shoulders, taking it seriously, and at this historic moment, making this the goal of our lives: building massive social movements and fighting for an alternative for working people, a serious alternative. What do you think of the language of pragmatism, and the way it’s been used since at least the Democratic primaries? How does it coexist with the possibility of unexpected or unanticipated political victories? That’s a legitimate question. Two things are critical to recognize: first, no, actually, at this moment, the very thing that millions of young people are looking for is a real fight back. It’s the opposite of the approach that has worked for the last twenty years. Look at the labor movement, of which I’m a member. Even among genuine well-meaning labor leaders, the habits that have formed around the consciousness of the past have the inertia of the past. Even among well-meaning people, we don’t have confidence that things can change. The labor movement has taken an absolutely horrendous beating from the capitalist class, and the downfall of the living standards of people of color has been part and parcel of that — it didn’t happen separately. It was part of the process. That inertia can prevent us from understanding that there are whole new generations that did not grow up in that period of demoralization. You will end up alienating them if you do not offer them a strategy that will allow them to really fight back. The second thing, in some ways, I think, is more important to understand: the peddlers of these ideas of “visionary pragmatism” are not ordinary people! The peddlers of these ideas are members of the ruling class. They are people who have an interest in keeping the ruling class together, but who are smarter about it than the more out-of-touch and more conservative elements of the ruling class. They understand that there is a hunger for change at the bottom, and they understand that they ignore that at their own peril. They want to co-opt it in some form or another. One of the things I’ve noticed is that for establishment media and for the establishment Democratic politicians in Seattle — and Seattle has been for decades ruled by the Democratic establishment — every aspect of the city is dominated by the Democratic establishment. For the establishment — it’s not just in my case, this is true in general — for an establishment that is trying to preserve a system that is now being roundly rejected by vast numbers of people, who are by their own volition rejecting what’s on offer to them, the ruling class has to find various ways of discrediting those ideas to keep people from thinking about how we could have a different kind of society. The establishment, especially at this moment, when people are so alive to the realities of capitalism, the bitter realities of capitalism, the establishment cannot succeed in that goal by saying “you are wrong to want to end police violence, you are wrong to want racial equality.” They cannot win that battle that way. They want to find passive-aggressive ways of discrediting those ideas. [My being] a straight white male would have made it easier for them to attack me. What is astounding is that they still tried it. In the reelection campaign, they poured in a lot of money to try and defeat us. Proportionately, we had to raise a lot of money. It was the most expensive race in Seattle city council history. But who do you think the establishment ran against me? They ran an African-American woman who said exactly those things: I’m from the neighborhood, she’s not from here, and she wouldn’t know. She said that at the exact same time that her campaign coffers were replete with money from every corporation you could think of that fought against fifteen dollars an hour. The CEO of Alaska Airlines donated the maximum amount to her — Alaska Airlines has been notorious for fighting and flouting the minimum wage law at Sea-Tac. It was not only the corporate money that flowed into her campaign from donations, it was the PACs. The result of the election, after all of that? They had combined Democratic and Republican donations, and we still won. That’s not to say it was easy. I don’t think we should be raising our glasses. We’re not going to win every battle on the left. But it was an example of how powerful it can be when you present an agenda that speaks to the needs of every community. And how does the Left respond to attacks like that without becoming reactionary ourselves about discourses around race and racism? There’s an insidiousness to prevailing ideas around “identity politics” in the way they’re used by the ruling class, by politicians, by academics who want to use these ideas, consciously or unconsciously, as a way of rejecting radical politics. A class analysis does not reject or minimize specific oppression. It simply provides a strategy to fight back and change. It simply provides a framework through which you recognize that if you want to win and end oppression, you’re going to have to take stock of capitalism itself, because it’s a part of the same system. We’re not going to succeed in fighting racism unless we move away from capitalism. I have no doubt in my mind that vast numbers of people will reach that conclusion. Will it be automatic and immediate? Of course not. People grow to newer and more complex conclusions once they’re part of social movements. Movements themselves are great teachers. You can’t go to school and learn this — you have to be part of live struggle, imbibing lessons from people around you. In that sense, identity politics is used by the establishment to push people into rejecting a class analysis, because that’s when you become a real danger to the system. When you recognize that it’s not simply about building protest movements against racism and winning a little bit here and there, but keeping the edifice that supports racism completely intact. There is a safety valve that lets the anger of the social movements be dissipated a little bit by the establishment speaking more rhetoric against racism and so on, but keeping you very insulated from reaching the conclusions you want to reach. That is insidious, and that kind of agenda is our enemy. But for the left, it is really important to understand that most ordinary people, most activists we run into, are not the establishment. They’re hearing things from different people, and for a lot of people, identity politics and privilege theory is the only ideological explanation on offer to them, so that’s their starting point. It’s my job as a person on the left to meet them at their starting point, not be hostile to their starting point, but at the same time not be coy about explaining why that is not enough — why, if we want to fight oppression, we will have to develop a class analysis as well, to understand how this oppression is part of a system. The idea that if you oppose Kamala Harris or Cory Booker, you’re racist, that the Berniecrats are racist, we should not be shy about rejecting those ideas. But we have to build a bridge that can be drawn upon at a later stage. Daniel Nima Moattar is a Chicago-based journalist. He has written and reported for the Nation, the Baffler, Guernica, and Vice News.